Our platform allows you to effortlessly build custom designed online websites and native iOS and Android mobile app business directories. Businesses can be loaded from your business registration list in order to populate the website. Optionally businesses can even claim their page in order to update their profile and start promoting your directory. 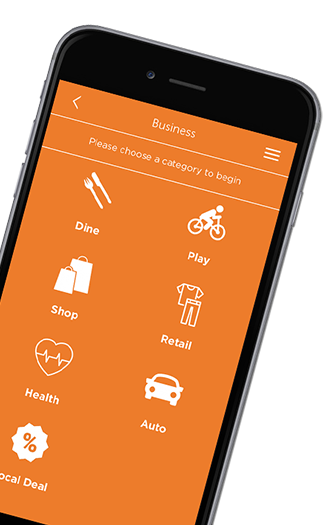 How can you use your city’s app and website as an effective business recruitment tool? The answer is simple: include a business directory to encourage businesses to establish themselves and grow in your community. Business owners are more likely to choose to do business in a city in which the local government supports, and is committed to helping to promote, local retailers. An online business directory promotes the local businesses that offer important services to your citizens. When employers choose your city to put down roots in, everyone will benefit. Job-seekers will have more employment opportunities. Citizens will have increased choices for restaurants, retail and services. As a result, your community will grow in diversity and thrive economically. Promote awareness of local businesses and the benefits of shopping local. We offer a web plug-in that allows you to not only have the business directory in your app, but also on your website. Move away from costly, and at times wasteful, printed maps and flyers. Provide tourists an easy-to-use app to connect them to all your city has to offer. Allow businesses to claim their profile (don’t worry, there is a moderator process) and add information like hours of operation, description, local deals and coupons. Allow your users to “Favorite” businesses that are important to them, putting that business one tap away by adding it to the quick menu. Highlight businesses by making them “Featured” and moving them to the top of the search in their category. Promote “New” businesses to drive awareness and promote economic development. Empower businesses to promote themselves and watch your downloads skyrocket. Local deals and coupons are a great way to drive engagement. Send out instant messages to your users. Promote events, new businesses and feature businesses by sending push notification messages to all your users or geo-locate users in a specified location. Easily see what is around you with our interactive mapping feature. 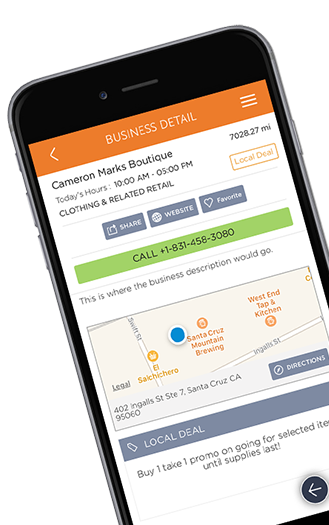 Locate yourself and all the businesses around you. Citizens can easily find a business and filter search results by distance or alphabetically. From there it is one tap to call or access directions to the business. Partner with local organizations like the chamber of commerce, visitor’s bureau or business district.